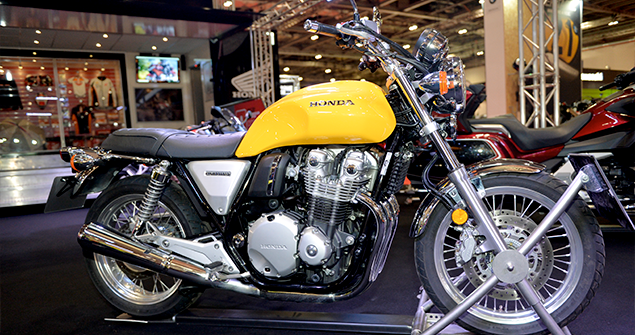 This year’s London Motorcycle Show played host to just about every big name bike manufacturer you can think of – BMW,Honda,Triumph, Davidson, Indian, Piaggio, KTM, Moto Corsa, Suzuki, Vespa and Yamaha, to name a few – with each one eager to showcase their greatest and latest machines to an equally eager viewing public. After three days spent carefully inspecting each one, listening to the designers and even getting to test a few out ourselves, we came away with a good idea of our top ten favourites for 2018. The Indian Scout exhibit never fails to impress us with their attention commanding cruisers, but this year it was a new addition to the Indian family that caught our eye; the Indian Scout Bobber. 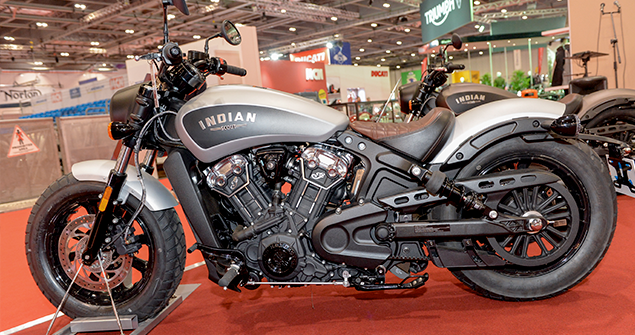 The Bobber made its debut at Indian Bike Week in 2017 and is the third model in the Indian Scout line-up, which also includes the Indian Scout and the Indian Scout Sixty. The Bobber is unique in that it has a darker tone to its styling. Its overall appearance has a more blacked out, muscular look thanks to chopped fenders, but it still shares the same engine as the standard Scout. Some additional style updates have also been added in; the headlight has been given a shroud, the ‘Indian’ badge on the fuel tank now has bold block letters and there’s a new tracker-style handlebar, new engine covers and new bar-end mirrors. The aluminium wheels have also been given the all-black treatment. Honda’s throwback to 1969, the CBR1100 EX, is an air-cooled, four-cylinder machine with some impressive detailing. The spoked wheels and slim brushed aluminium side panels is a look straight out of the flower power era, but the slipper clutch, revamped engine and use of chrome gives it just the right amount of twenty first century styling. 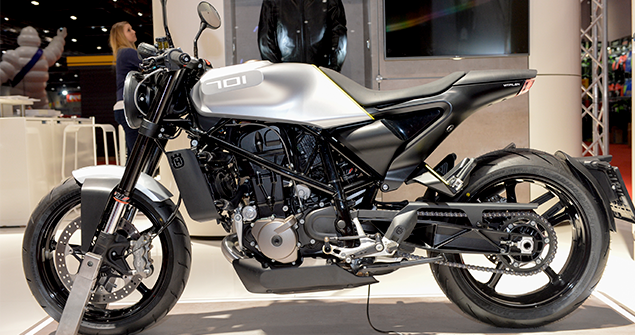 Husqvarna’s impressively designed 692.7 liquid cooled street bike easily fits into our top 10 this year. With a peak horsepower of 55kW (75hp) and 72Nm of torque at 6750 rpm, there is no doubting this bikes performance potential. It’s not always about the big bikes! 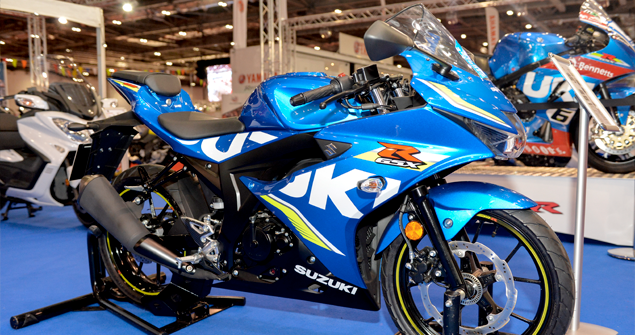 As proved by the revolutionary Suzuki GSX-R125. With its nod to MotoGP, this aerodynamic125cc Suzuki has the best power to weight ratio, torque to weight ratio and acceleration for its 125cc class. The GSX-R125 MotoGP features a convenient key-less ignition system. The rider can start the engine as long as the compact key is close enough to the motorcycle, and what’s really cool is the bike has a full LCD instrument panel set inside its very own dashboard. We think Harley may have turned a ‘youth appeal’ corner with this Street Rod. It was always going to be a challenge to build an affordable bike that would appeal to a younger rider, but that’s something Harley seemed to have that boxed off when they brought out the Street 750 a few years ago. 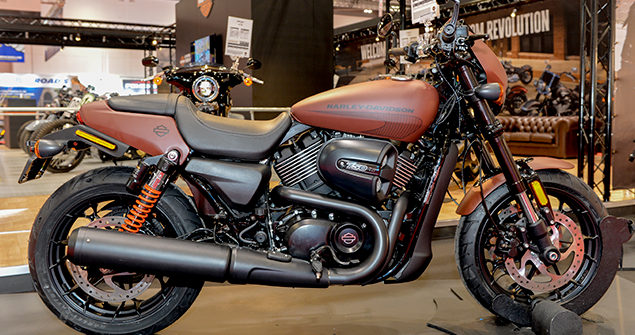 Yet the new and improved Street Rod XG750A seems to be ticking even more boxes for the youth market. While it has the same motor as the Street 750, the engine has new cams with increased lift and duration, high flow heads and dual throttle bodies, all of which boost the power to 69bhp and the torque by 10% to 47.9ftlb. OK so this one may not be in everyone’s price range, but at around £68,000 BMW’s brand new 212hp Superbike is certainly impressive, even if its just to look at. 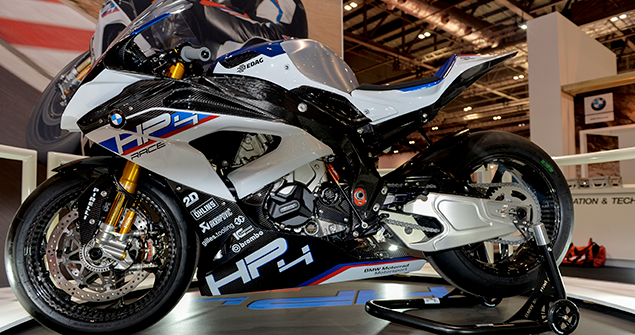 Dubbed the HP4 RACE, it features a full carbon fibre frame weighing just 7.8 kilograms. BMW claim the HP4 RACE is the same spec level as current factory superbikes, but at 171kg when fully-fuelled and track ready, the HP4 RACE actually comes in lighter than the current World Superbikes. 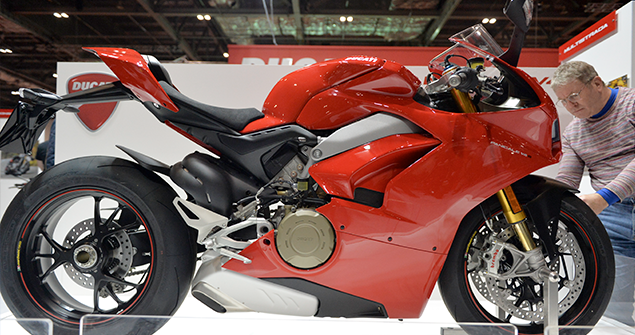 We couldn’t have a top ten without including at least one Ducati, and this year that’s the Panigale V4. Awarded the ‘Most Beautiful Bike’ at EICMA back in November, the V4 certainly drew the attention from the London show goers and it’s not hard to see why. 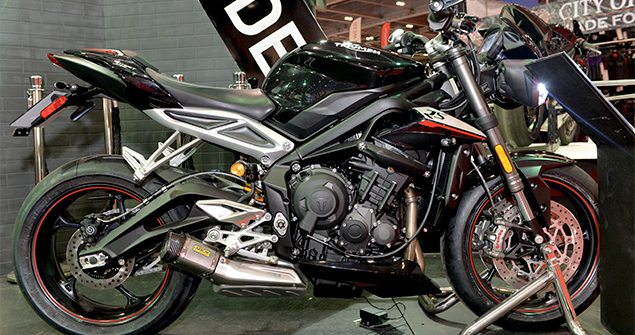 Triumph’s range topping new Street Triple RS was on display in all its triumphant glory, ready to delight the brand’s many fans. The RS is the second variant of the new- Street Triple to be launched in India after the standard Street Triple S launch earlier this year. Boasting 121bhb at 11,799 rpm and a torque of 77 Nm at 10,800 rpm, the RS also comes with a very impressive programmable 5-inch colour TFT screen working as the instrument console, switchable traction control and Brembo brakes. And if that’s not enough there’s also 41 mm Showa big piston forks upfront and an Ohlins monoshock at the rear. Honda wasn’t the only manufacturer to exhibit a modern day classic over the weekend. 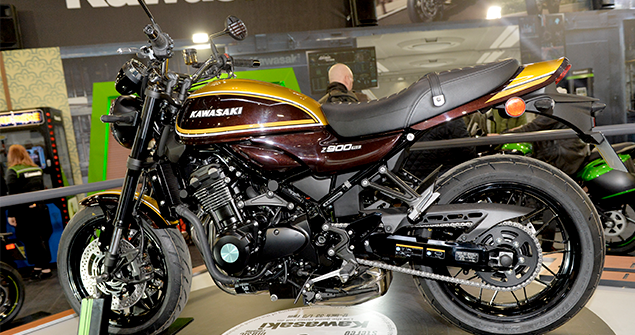 Kawasaki introduced London visitors to their very own Z900RS; a nod to the 1972, 83bhp, 903cc, inline four-cylinder ‘900 Super 4’ Z1, and beaming with just as much 70’s style and charm. 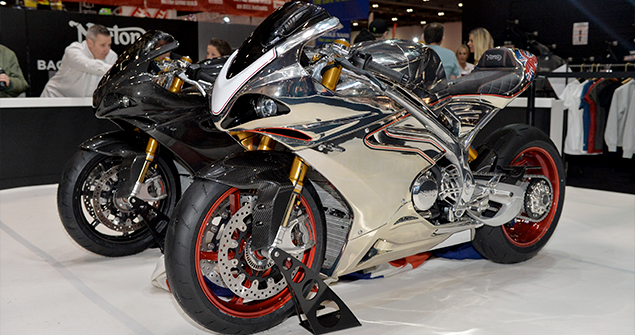 Without doubt the shiniest bike at the show was Norton’s Chrome 1200cc liquid cooled V4RR. This glorious British motorcycle features a quickshifter with down-shift auto-blipper, adjustable engine breaking, riding modes, cruise control and an on-board data logging system. Engine mode adjustability includes road, track and pro-race. Norton call the V4 the most technologically advanced British motorcycle its ever made, and based on the specs alone we’re inclined to agree. We thought Triumph’s 5-inch TFT screen was impressive, but it paled into insignificance when compared to Norton’s 7-inch display. What were your favourites from the show? Let us know in the comments!